“We are what we eat”. The food we eat has a long-lasting impact on our intestines too. There are a lot of accumulated microbes in the gut and the way we eat could improve the health of the organisms or make them worse. The gut microbes are very sensitive to the food that we eat, be it fruits and vegetables, burgers, pizzas, beef or dairy products and research is ongoing to get knowledge about foods having a positive impact on the gut. It is quite easy to maintain your gut healthy with your balanced food intake and healthy lifestyle changes. Include fruits and vegetables: Prefer red, orange, and dark-green vegetables along with other vegetables for your meals. Add fruit to your diet as part of main or side dishes or as dessert to get the fibers, vitamins, and minerals your gut needs to be healthy. Switch to fat-free or low-fat dairy products: It has the same amount of calcium and other essential nutrients as whole milk with fewer calories and less saturated fat. Eat lean protein: Select leaner cuts of protein to make your intestine healthy. Low sodium: Select low sodium version of foods. Drink plenty of water instead of sugary drinks: drink water and healthy juices or unsweetened beverages instead of Soda, energy drinks, and sports drinks as they are loaded with sugar and calories. Eat some seafood: Add Seafood to your diet to get protein, minerals, and omega-3 fatty acids. Avoid junk food: Avoid junk food to keep your gut healthy. Eat slowly: You should eat slowly to control your portion and cut your calorie intake. Exercise regularly: It keeps you fit and healthy and boosts your digestive system and immunity. Avoid foods that upset the stomach: You should avoid unhealthy foods that upset the stomach to get a healthy intestine. 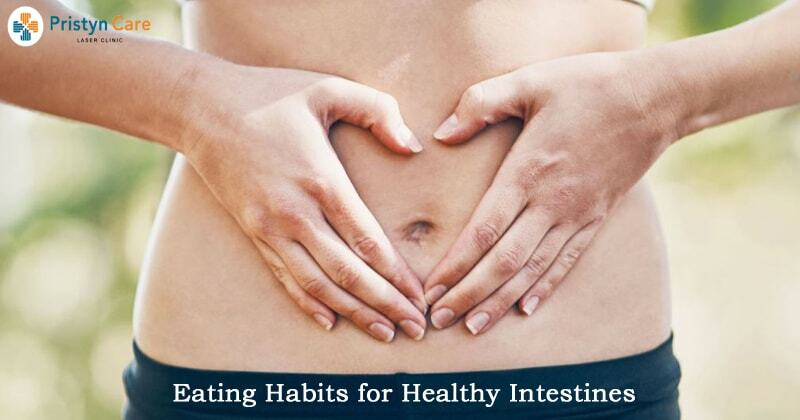 A healthy intestine makes you feel light, more energetic, and comfortable. Eat right and do exercise regularly to get a healthy gut and a sense of well-being.